It doesn’t happen too often in Southern California, but floods do come up every now and again. 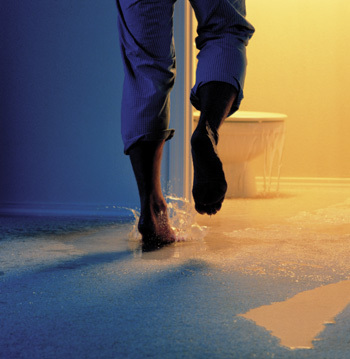 A flood can result in a ton of damage, ruining furniture, carpet, upholstery and more components of your home. Floods can also give you health risks if not handled professionally and thoroughly. There can be contamination of water, and even food because of the improper clean-up of a flood. The worst case scenario is that you or your loved ones can become infected. Additionally, there’s an increased chance for mold-growth in your home if your house isn’t properly restored after a flood. The bottom line is that if you experience a flood, then you will need to hire professional help. Professional cleaners have the equipment for removing water, drying your home and dehumidifying your house. On top of that, professional cleaners have special gear to wear, protecting them from getting infected while restoring your home. If you plan to clean up or restore your flooded home, then there’s a high risk of getting sick. Professional cleaners will also test out your water when the clean up is finished to see that the water purifying system in your home is safe. Professionals will have you covered and get all the steps done thoroughly. The areas where flooding most often occurs are at places like Escondido or Imperial Beach. Professional cleaners are certified in handling water damage restoration and most are available 24 hours a day, 7 days a week. Attempting to clean up the mess a flood leaves behind is a feat too great to accomplish on your own. Watching a 10 minute video or reading up on water damage restoration for 5 minutes will not be enough in attacking the damage a flood can do. So don’t hesitate to call professional cleaners to help you get the job done the right way.